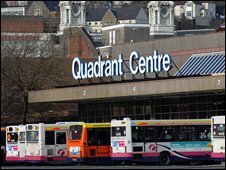 Swansea's Quadrant bus station is to have an £11m makeover. Deputy First Minister Ieuan Wyn Jones has announced the long-awaited project has attracted European funding. The existing station will be replaced with a modern, high quality facility to cater for buses, coaches, and Swansea Metro vehicles, dubbed bendy buses. Mr Jones said the "passenger-friendly" building should encourage more people to use public transport and help with the regeneration of the city centre. He made the announcement during an address on the Convergence programme, which has replaced Objective One European funding. Mr Jones said the Welsh Assembly Government had awarded £5.2m of European Regional Development Funding (ERDF) to enable the Quadrant project to start. The new station will provide 20 bus bays, three coach stands, a passenger concourse, offices, a drop-off point and toilets. He said: "I am delighted to confirm approval of this project which will improve the quality of public transport in Swansea and south west Wales. "It will offer a modern, passenger-friendly service, improving access into Swansea and assist in the regeneration of the city centre and the wider region." Swansea council leader Chris Holley said the news was a good step forward for Swansea and the region. "The bus station is one of the major gateways to the city and to the region. "Its transformation into a transport interchange will provide a much more welcoming environment for commuters and visitors alike and also provide opportunity for city centre regeneration."